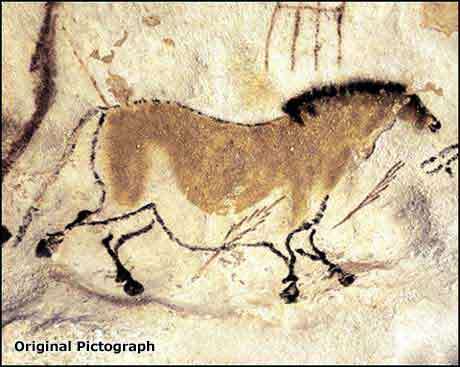 This ancient horse was called "Chinese" because of its resemblance to Sung dynasty horse paintings. Pictographs refer to painted (as opposed to carved) representations created by our pre-historic ancestors. 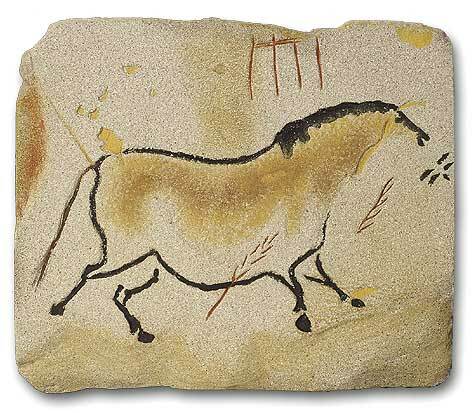 The lovely painted horse, represented in our exclusive full size recreation, was found painted on the calcite covered walls deep within the subterranean tunnels at Lascaux, in France. The artist painted by flickering fire light, using handmade paint consisting of ground pigments combined with animal fat. The paint was applied directly to the wall, or, in some cases, blown through hollow reeds for special effects. The delicate execution of the painting and its remote underground location suggest the artist wanted the work to be protected and survive. It remained hidden until the cave was discovered by children and explored in the 1940s. 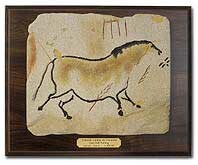 Share the dream of an ancient artist and allow the beauty of this 17,000 year old art to brighten your cave. Size: 8.5" x 9.5" x 1"